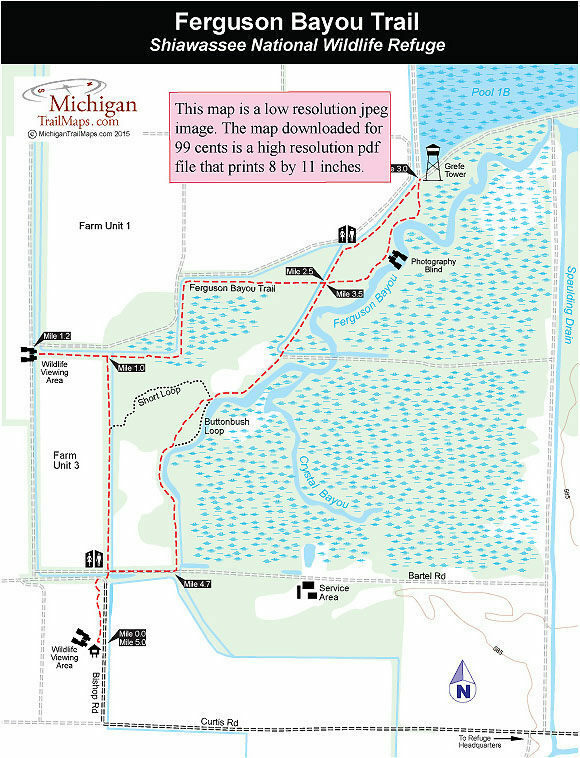 The Ferguson Bay Trail in the Shiawassee National Wildlife Refuge is an interesting walk almost any time of the year, as it provides dry footing through an area of marshes, ponds, sloughs, flooded forests and other moist soil units managed for a variety of wildlife. But during the peak migration seasons of March through April and September through early November, this day hike offers an impressive view of waterfowl, especially Canada geese. At the height of migration, some 25,000 geese and 40,000 ducks gather on the refuge. From the observation tower, the halfway point of the 5-mile hike, you can watch flocks of hundreds rise in unison off the water, circle the refuge twice, and then depart. You are also sure to spot muskrats and possibly a variety of other wildlife, including great blue heron, great egrets, bald eagles, or some 200 other species of birds, as well as beaver or white-tailed deer. The entire trail system totals 5.5 miles with the main trail being a 4.75-mile figure-eight from the trailhead parking lot to the Grefe Tower and back. The route described below includes a quarter-mile spur to an observation blind for a 5.25-mile outing while a crossover spur called the Short Loop reduces the hike to a 2-mile loop but misses the most impressive sections of the trail. Calling Ferguson Bay Trail a trail is a little misleading. What you are walking on most of the time is a series of dikes that form a maze through the heart of the refuge. On either side of you might be a marsh, a flooded pond, a wooded area, or a field of corn planted to provide food for waterfowl. Most likely you’ll see muskrats swimming in ponds or scurrying down the dikes, but keep a sharp eye out for ducks, other birds, turtles, or the downed trees that were gnawed by beavers. Ferguson Bay Trail is also open to mountain bikers and the hard, wide surface of the dikes makes it an ideal one for beginners or off-road cyclists whose main focus is to search for wildlife. 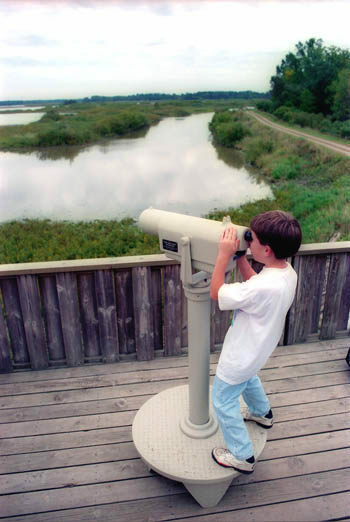 Scattered along the trail are four observation decks, two with spotting scopes, and almost a dozen interpretive panels that focus on the refuge operations and wildlife. At the Bishop Road trailhead are interpretive displays and the first observation deck that allows you to search the surrounding fields for geese. From the the northwest corner of the parking area a posted trail heads north as a mowed lane and quickly reaches a dike and then swings east on it briefly to reach a vault toilet within a quarter of a mile. 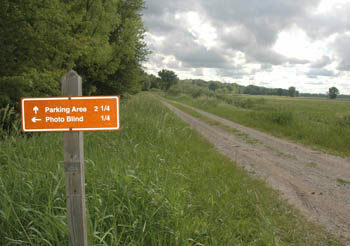 Signs direct you to continue due north along a dike lined by trees but with fields on both sides. Within a half mile you pass the junction with the Short Loop and then at Mile 1 arrive at another posted junction. Head west (left) on the two track to reach an observation blind where you can use a spotting scope to look for geese in the fields or flocks of mallards, green-winged teals, and black ducks on Pool 2 to the north. Backtrack to the junction and follow the trail as it zigzags its way east through a low-lying forest. Birding is good here as well as this area is home to Eastern screech-owl, red-bellied woodpecker, house wren, yellow-billed cuckoo, blue-gray gnatcatcher, wood thrush, yellow-throated vireo, indigo bunting, Prothonotary warbler and northern oriole. At Mile 2.5 you arrive at a four-way junction where signs indicate to turn north (left) for the observation tower. You pass a second set of vault toilets and at Mile 3 reached Grefe Tower that was rebuilt in 2010 to make it handicapped accessible. 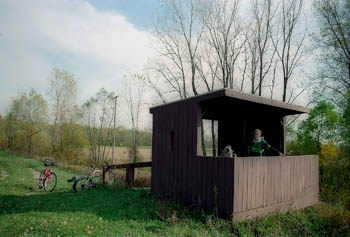 The wooden structure features a spotting scope and provides an overview of the fields and ponds bordering the Shiawassee River, with more crops to the west, impounded water to the northeast, and, if its fall, geese everywhere. By the hundreds or even thousands they will be waddling through vegetation, floating on the surface of ponds, or running across the water in a Herculean effort to get their eight-pound bodies airborne. Bald eagles can also been occasionally from the tower. The returned trail from the tower is well posted and is more of a forested path than a gravel two-track. It immediately reaches Ferguson Bayou, a beautiful area of low-lying woods and marshes. Within a third of a mile you pass the photography blind, a small hut on the edge of a marsh pond, and at Mile 3.5 you return to the four-way junction that you passed earlier. Head south (left) this time on the gravel two-track. You remain in sight of Ferguson Bayou and at Mile 4.1 arrive at the junction with the Short Loop and then with Butterbush Loop, a short grassy trail that stays close to the bayou before returning to the main two-track. At Mile 4.75 signs direct you to head west (right) to the vault toilets where you turn south (left) to return to the trailhead parking area.